ISSOL Suisse connects the building industry with the glass industry to spread unique and beautiful solar-active building materials in Switzerland and internationally. ISSOL Suisse SA was founded in 2016 by Sébastien Eberhard and Laurent Quittre thanks to the support of the CSEM, Neuchâtel, with which there is close cooperation in research and development. Laurent Quittre is also the founder of ISSOL Belgium who have been implementing the most prestigious solar architecture projects in Europe since 2006 and now the first projects in Ticino and Western Switzerland have emerged. 2018: the board of directors welcomed Olivier Müller and Michael Hiestand. Oliver Müller occupies the position of CEO and manage also the partners and customers of the Romandie part of Switzerland. Dr. Michael Hiestand is the commercial director and sales manager for German speaking Switzerland. 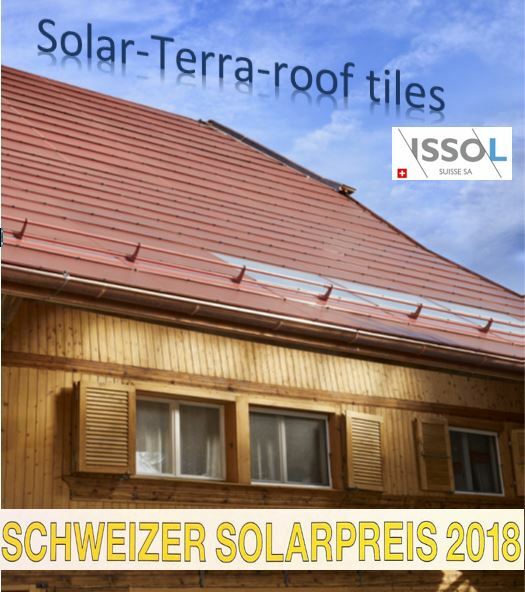 Issol wins the Swiss Solar Prize 2018 together with CSEM for a restoration project in Ecuvillens with the Solar-Terra roof tiles developed in Switzerland for Switzerland. ISSOL's first reference project in German-speaking Switzerland will be completed in December 2018: An apartment building in Zurich whose façade is completely equipped with ISSOL's solar-active glass elements. The aim of ISSOL Suisse is to develop and to merchandize in Switzerland and internationally new strong construction material that integrates the best of photovoltaic and glass technologies resulting in colored or transparent energy positive glass (EpoG) produced in belgium for buildings in Switzerland and all over the world.